This post by Brad Taylor is part of Secession Week 2010: Economic Secession. I don’t think it’s too much of an exaggeration to say that the bulk of human progress we’ve seen in recent centuries has been driven by reductions in transaction costs. Large-scale cooperation through trade and the division of labor have only become possible with the development of a number of technologies. One important such technology is money: without a medium of exchange, trade could only occur with a double coincidence of wants. Prosperity requires a good which is easily transportable, divisible, scarce, and readily recognizable and measurable. Historically, gold and silver have often served this purpose, becoming generally-accepted mediums of exchange. Of course, there’s no need to actually hand over gold or silver when making a transaction: a credible promise of a real commodity in the form of a paper note serves the same purpose while being more easily transportable and divisible. Inflation is the enemy of capitalism, chiseling away at the foundation of free markets and the laws of supply and demand. It distorts price signals, making retailers look like profiteers and deceiving workers into thinking their wages have gone up. A currency with high and uncertain inflation is less useful as a medium of exchange. If we mentally unbundle government functions, we can think of individuals opting out of their government’s currencies and choosing using an alternative – whether produced by another government or by private institutions – as partial secession. We see such monetary secession fairly often, even when governments go to great lengths to protect their monetary monopoly. One type of monetary secession results from the fact that there are large differences in the quality of money issued by governments around the world. While many Americans justly complain about the Fed causing inflation in the U.S., the U.S. dollar is a far better product than many foreign alternatives. The Zimbabwean dollar under the control of Mugabe, for example, became a rather poor product indeed. By printing huge amounts of money, the Zimbabwean government removed the scarcity of its currency and made it a next to useless medium of exchange. At one stage, prices were doubling roughly every 24 hours and therefore signalled very little. The graph below shows the path – in logarithmic scale! 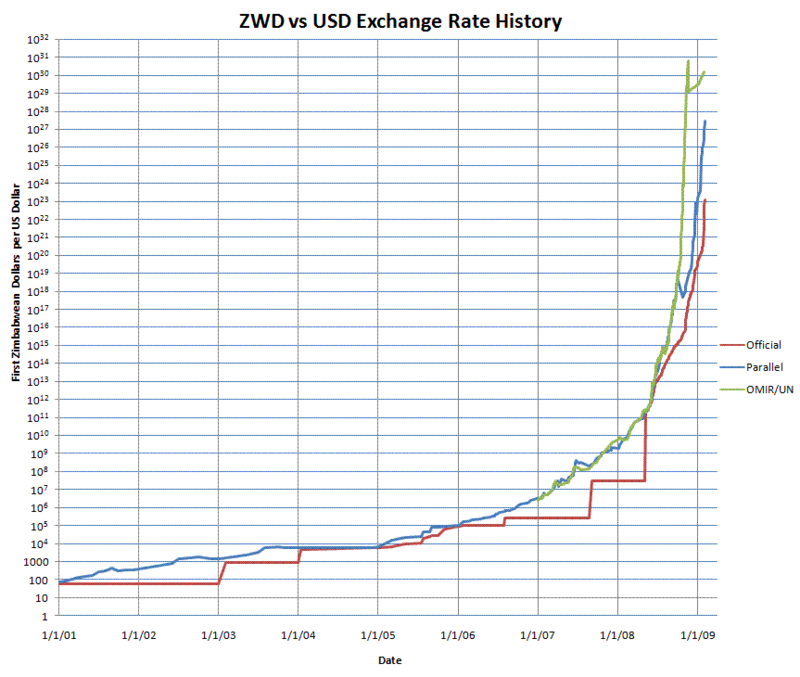 – of the Zimbabwean dollar’s exchange rate against the U.S. dollar. It’s interesting to compare this type of monetary secession to the idea of charter cities. Economist Paul Romer thinks setting up enclaves of relative economic freedom in poor countries, often based on the rule-sets of successful countries such as Singapore, will give locals a chance to migrate a short distance to the charter city and effectively live under the rules of a much richer and more distant country. Dollarization and charter cities both give those living with the worst products in the governance market to upgrade to the best currently available. In contrast, private currencies, like seasteading, would create the conditions under which the quality of the best products would improve. Even absent hyperinflation, the slow inflation of currencies and uncertainty as to their future value has costs. As with all goods, a competitive market for currencies is likely to increase product quality. Private firms, lacking the coercive powers of the state, would need to back their currencies with commodities to attract customers. This is how physical private currencies such as the Liberty Dollar and digital currencies such as e-gold have operated. Unfortunately, governments don’t like competition and both Liberty Dollar and e-gold have run into problems with the authorities, the former for, well, competing with government and the latter ostensibly for making life easier for criminals. Given the difficulties of competing with an established monopolist, some are taking other approaches to monetary secession. Community currencies allow people to use an alternative locally while still using the national currency when trading farther afield. Another option is to trade directly in commodities such as gold and silver. Since there is no currency acting as an intermediary, there is much less potential for government control. Looking further into the future, it might be more likely that the current money monopoly is undermined by people opting out of the system by using technology to fly under the radar. Creating secure and widely-accepted digital currencies would be an important part of that effort. In any case, monetary secession is difficult when the state doesn’t want you to secede. Great post, I very much enjoy blogs about mediums of exchange. For a truly useful currency, it needs to be an arbitrary measure of relative value. Money should not have intrinsic value and should act as a neutral measuring tool, like a ruler. People don’t make measuring tapes out of gold, or silver, that does not enhance the usefulness of its ability to measure something, and leads to people hoarding measuring tapes. Money, hard cash, really needs to depreciate over time at a rate that encourages its velocity through the economy. I suggest folks look into http://en.wikipedia.org/wiki/Silvio_Gesell, and Bernard Lietaer’s “Future of Money,” http://en.wikipedia.org/wiki/Bernard_Lietaer for some interesting reading on alternative forms of currency. The first entity to adopt a currency like this will find itself on the top of the economic heap in short order!